As most of you already know, I just got back from my trip to Spain a few days ago. Although I was only there for about 5 days, it was an amazing trip and already has me wanting to go back! The first time I went to Europe was back during the summer of 2015 when I studied abroad in College. That summer I was mainly in Central Europe which left a lot of countries that many Americans visit (Britain, France, Spain etc.) still on my bucket list. What spurred this trip was that one of my friends from College and his girlfriend had moved to Spain to teach English for a year and had generously offered a place to stay for any friends who came to visit. Me and one of my sorority sisters both love traveling and decided to make the trip to Spain happen especially since all 3 of us were friends in College. After all, it isn’t all the time that you have a place in Spain to stay for free! The weekend we decided on was President’s weekend here in America which meant a 3 day weekend for my friend but sadly not for me. I ended up taking a total of 6 days off from work giving me a vacation of 8 days; Wednesday to the following Thursday. We landed in Barcelona on Friday around noon and flew back to the United States around 6pm on the following Tuesday. 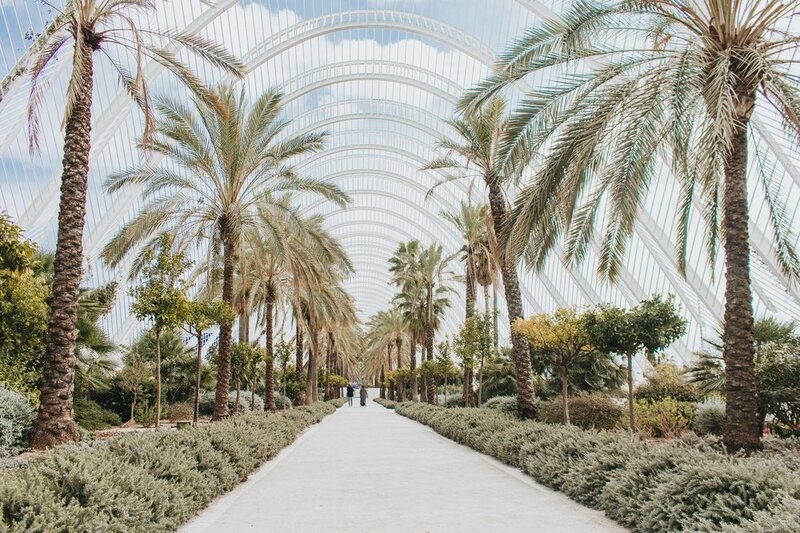 For our 5 days in Spain, we split the time between our friends’ town of Tavernes de la Valldigna, Valencia and Barcelona. Friday evening and Saturday we spent in our friends’ town but then on Sunday, we took the train up to Valencia for the day to explore and see a Football match! The train station dropped us off in Old Town so we explored the streets there. First of all, all of the Architecture was absolutely amazing! Part of the reason I love Europe is because of the buildings how you can be walking down a street, randomly turn a corner and BAM, right in front of you will be some amazing Cathedral or something! Because we went on a Sunday, most things were closed since that day tends to be reserves solely for family time. 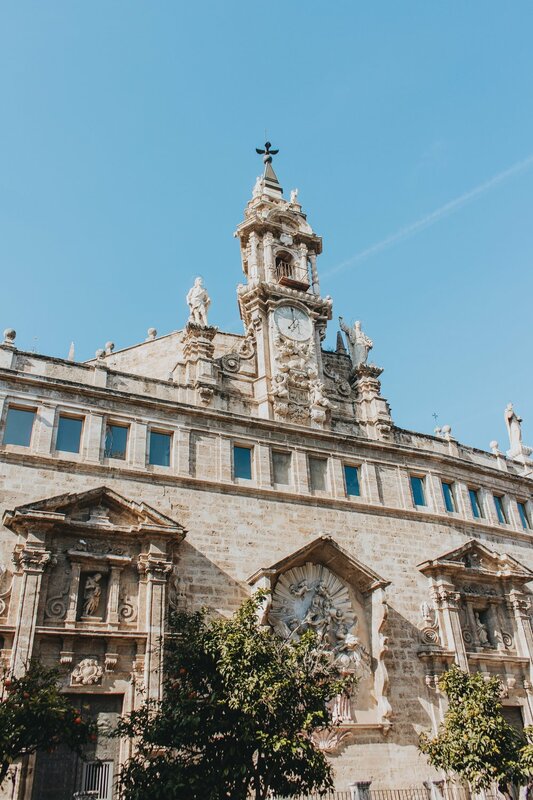 Besides stopping to get some coffee (or in my case, some freshly squeezed Valencian Orange Juice), we wandered around the streets and took it all in. In one of the squares, you could see and hear them starting to set up for the Falles celebration that happens next month in the city. One of the main attractions is the Cathedral which luckily was open. We didn’t pay the entry fee but there was the option to pay €3 to climb the 207 stairs to the top of the tower. I definitely recommend doing this because not only are the stairs good cardio, the view from the top is amazing! The football match wasn’t until about 4:30pm so after Old Town, we headed to the City of Arts and Sciences. Honestly, if you have no idea what that is, go Google it because it is seriously AMAZING! It is ironic just how opposite it is from Old Town! I felt like i had stepped into a whole new, futuristic world. Sadly we did not have time to explore each building especially the Museum of Science but even walking around the complex was an amazing experience! The main buildings in the complex are the opera house, the museum of science and the IMAX cinema. There is also an open structure filed with plants and trees that you can walk through (seen in the last two photos below). The tiles underneath the water are painted a gorgeous aqua color which makes the water appear to be a piercing blue. I’ve never been to the Blue Lagoon in Iceland but the color reminded me of the photos I’ve seen from there! Next stop was the football game! Although I have been to several Portland Timber’s matches, I feel like watching a live match while in Spain is the real deal. The football match we went to was Valencia CF versus RCD Espanyol. It was a close game and unfortunately ended at a 0-0 tie. 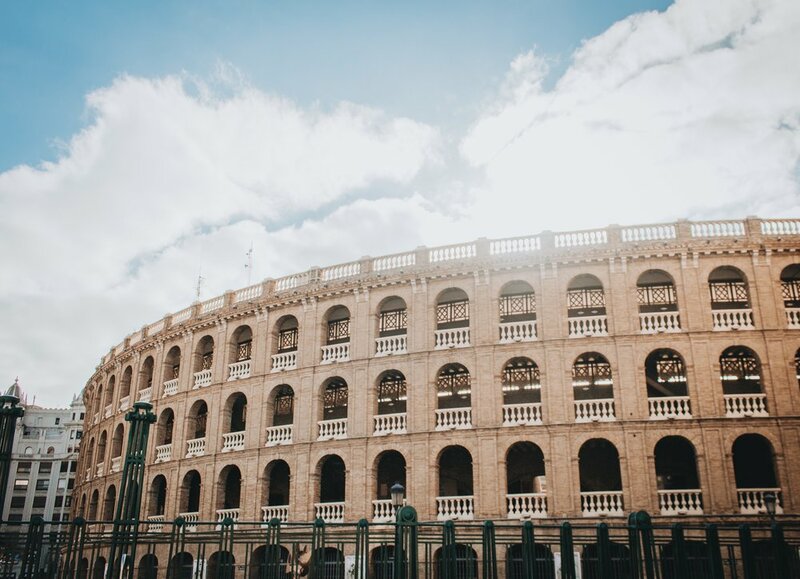 If you have the chance while in Spain, I definitely recommend adding a football match to your agenda! On Monday morning, we reversed our journey from Friday and headed back up to Barcelona. This journey called for a taxi from our friends’ place to the train station in Tavernes, then another train from Tavernes to Valencia, followed by one more train from Valencia to Barcelona. We ended up missing our train to Valencia by a few minutes and barely made it by Taxi to the Valencia Joaquin Sorolla station in time for our last train! Luckily it all worked out and we arrived in Barcelona around noon. 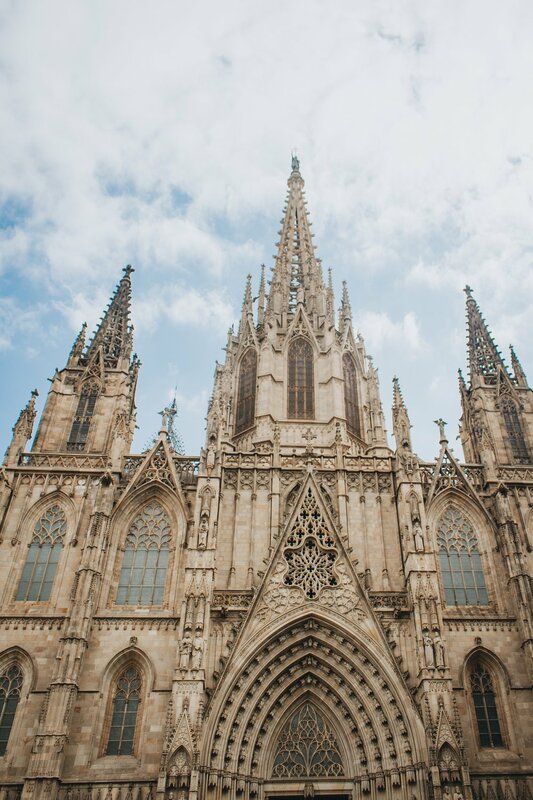 While in Barcelona we stayed at The Moods Catedral Boutique Hostel which I highly recommend! I’ve stayed in quite a few hostels but this one was practically a hotel. There was an amazing receptionist who helped us a ton and we had a private room with a balcony. 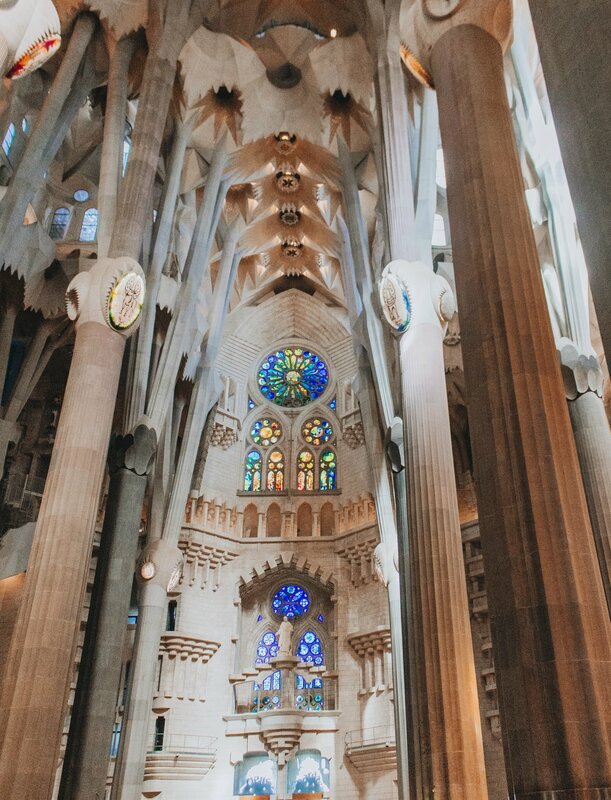 The first stop on our list was the Sagrada Familia. Everyone I talked to that had been to Barcelona, recommended it! We bought our tickets ahead of time which I definitely recommend. They are also pretty strict about being on time for your tour slot so make sure you get their early! The cathedral s pretty big and we had to walk around the whole building before finding the correct entrance. Our time slot was for 2pm which ended up being perfect! The inside is covered with stain glass windows and the sun was streaming through beautifully that afternoon. In addition to the actual cathedral, there is a museum about the history of the building. In total, I would recommend giving yourself 2-3 hours to completely read and see everything. 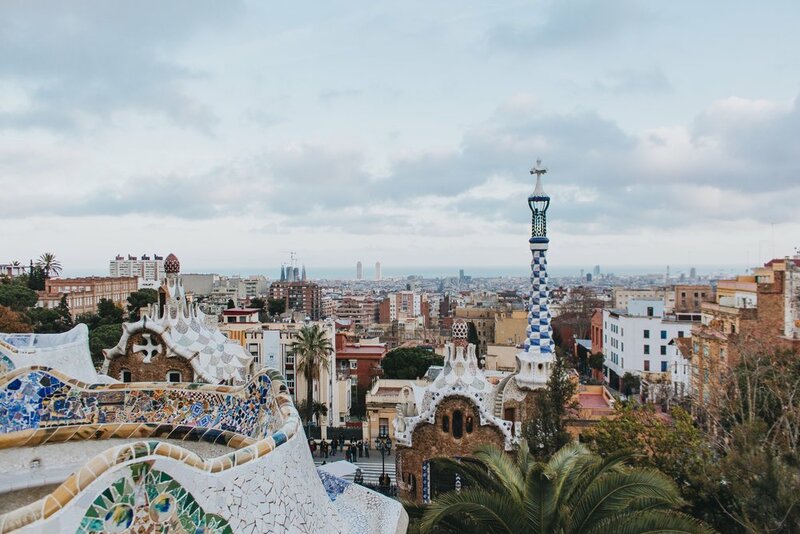 One of the sights I was most excited to see was Park Güell because the ceramic work always looks amazing in everyone’s photos! The park is definitely out a ways from the central part of the city and sadly there are not any direct Metro lines to get there. We ended up taking the Metro and then walking up the hill to the Park. Next time I am definitely going to bring water because it was a decent walk! When we got there, we learned that in order to access the Monumental Core section of the park, you have to pay entry to one of the 30 minute time slots. At the time we arrived, there was only room left in the last time slot of the day at 6:00pm; right before the sun was going to go down! The tickets to the park are only €8.50 but I would definitely recommend trying to buy tickets ahead of time if you want to guarantee a ticket. We were worried about killing the hour and a half before our time slot but the park is huge and we ended up having no trouble finding other things to look at. For example, the more organic structures were outside of the Monumental Core and then the buildings with the famous tiles are inside the Monumental Core. If we had had more time in Barcelona, the park could be a perfect place to spend a whole afternoon and maybe bring a long a picnic. We started out having a ton of plans for our last day in Barcelona but had to cut out most of them due to time. One of the places that did make the cut however was this beautiful concert hall. 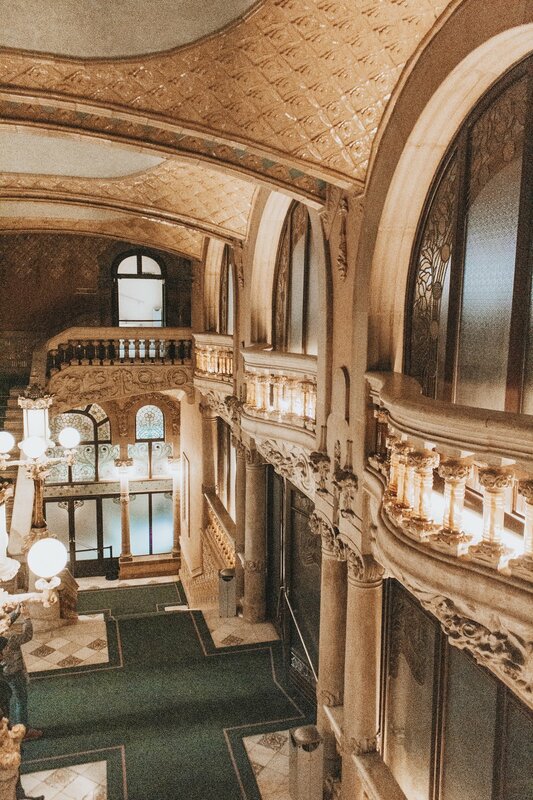 While most people automatically think of Gaudi as the main architect of Barcelona, another famous architect of the city was Lluís Domènech who designed this amazing building. 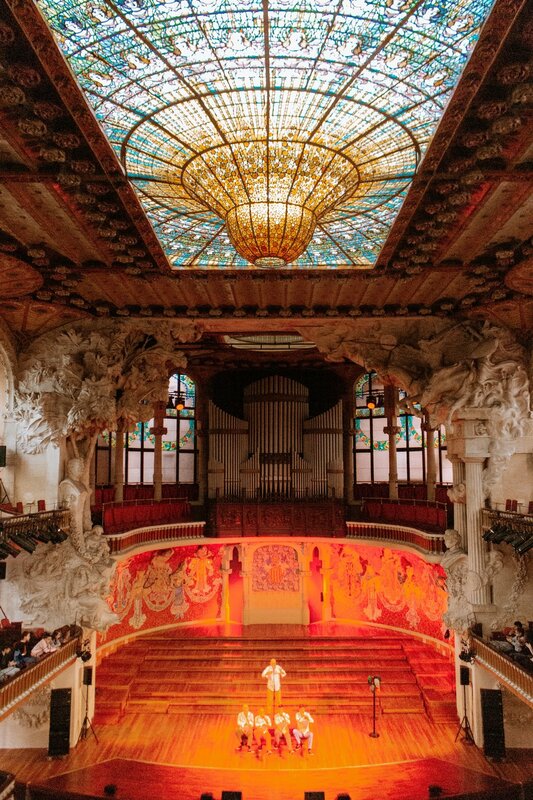 While on our tour of the building, we got to sit in on a children’s concert in the hall which is absolutely stunning. I honestly can’t imagine how it must look from the perspective of a performer standing on the stage. After hearing a few songs, we headed out to the second floor that has the line of tiled pillars that I had seen in many photographs online. I would definitely recommend adding this place to you list of sights especially so you can get a view at another Spanish architect’s work. The last thing we did before heading back to our hostel to grab our bags, was visit the marketplace for lunch. If you have been to Pike Place Market in Seattle, I would say this market was pretty similar. The displays at each stand were absolutely amazing. The front of the marketplace was mostly stands with fruits, fruit cups and juices. As you moved further back, there were stands with meat and cheese pastries, seafood and meat. My favorite stands were probably the ones displaying all of the candy! The prices were a little steeper at the market but I would say it is worth it for the experience!